When every bank is promoting itself as the best bank in the Philippines, you can’t help but wonder which one actually delivers. A bank that offers a low minimum deposit and doesn’t charge you every time you touch your money definitely sounds like a winner. However, to get the best deal you must look at the bigger picture. Whether you’re a student, entrepreneur, expat, OFW, or anyone who wants to save, this guide gives you a leg up in choosing the best bank in the Philippines. At a Glance: The Top Banks in the Philippines. What Type of Bank Do You Really Need? How We Chose the Best Banks. 3. Few or no limitations on the number or method of transactions. 4. Accessible location of the bank and its ATMs. 5. Secure online and mobile banking. 8. Reliable and efficient customer service. Best for Savings: Bank of the Philippine Islands (BPI). Best for High-Yield Savings: Security Bank. Best for Checking Account: Philippine National Bank (PNB). Best Rural Bank: One Network Bank (ONB). Best for Time Deposit: Security Bank. Best for Students: Bank of the Philippine Islands (BPI). A study by the Bangko Sentral ng Pilipinas (BSP) showed that 22.6% or about 15.8 million Filipino adults have formal accounts. Of these formal account holders, only 11.5% said that their money is held by banks. 1. Savings Account – is where you put your money if you want to build your emergency fund or save up for something important like a car, wedding, or a vacation. It requires a low initial deposit so students or anyone with an unstable income can open an account. The drawback is its annual interest rate of less than 1% and penalty fees that you’ll incur if your balance falls below the required maintaining balance. 2. Checking Account – is a type of deposit account that you mainly use for payments. It requires a higher initial deposit and maintaining balance than a savings account. A checking account allows you to issue checks which aren’t possible if you’re a savings account holder. Use this account if you have loans that require repayments through post-dated checks or for regular transactions such as payments for bills, tuitions fees, rent, and business expenses. 3. Time Deposit Account – pays higher interest than a regular savings account. The money you put here is kept for a fixed period of one month to seven years, during which the bank lends and invest the money to earn you a higher interest of up to 3.50%. Only choose this account if you have money that you won’t be touching anytime soon. While it’s possible to withdraw the money prematurely, it comes with a huge penalty fee that easily beats the money you should have earned. 4. Dollar/Foreign Currency Account – ideal for those who regularly transact using foreign currencies including OFWs and their families, online business owners, and regular travelers. Money in dollar accounts also earns interest in dollars. You can also opt to withdraw your money in peso with a better exchange rate than most money changers. Aside from US dollars, you can also open an account for other foreign currencies such as the British pound, euro, Chinese yuan, Hong Kong dollar, Japanese yen, and many more. 5. Joint Account – is preferred by couples, associations, or business partners who want to keep their income under one account. A joint account can be a savings, checking, or time deposit account. The account holders may choose either a joint “AND” account or a joint “OR” account. The former requires both signatories for any withdrawal to take place while the latter allows either one of the account holders to withdraw without the need for the other one’s signature. These types of bank account cater to the different needs of people. Identify your needs or the exact reason why you want to open an account. Then, choose a bank that can fulfill those needs. 1. Commercial bank – offers the widest range of services for both businesses and individual depositors. With these mainstream banks, you can open a savings account, invest money, or secure loans. 2. Thrift/Savings bank – focused on helping individuals and families to secure their financial future via cash deposits. The bank invests the money they collect to help grow it and give the depositors a higher earning potential. 3. Rural bank – also known as a cooperative bank, this institution finances agricultural projects and offers high-interest yields to help boost the rural economy. Each bank in the Philippines has its pros and cons. 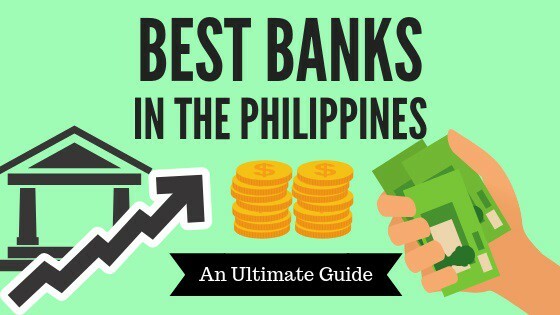 The key to choosing the best bank in the Philippines is to know the criteria that are most important to you and then pick a bank that excels in these areas. The next section discusses these criteria and how we used them to choose the best banks in the Philippines for different categories. Banks aren’t the best place to make your money work hard for you; there are a lot of investment vehicles that can do better. However, putting your hard-earned money in a bank account is better than storing them under your bed. For one, banks pay you annual interests for just letting them store your money. The downside is whatever small interest you earn, it can be offset by the numerous fees that the bank charges for its services. Before entrusting your money to the bank, read the terms and agreement in the contract and pay attention to “hidden” fees that may not have been discussed to you. The worst banks in the Philippines charge you for every transaction, whether it’s for ATM use, overdrafts (a fee charged when you withdraw money that exceeds available balance), transferring money between accounts, and the list goes on. Fees allow banks to maintain their daily operations but when you get charged for literally every transaction you make, consider it as a red flag. A lot of Filipinos store their money in banks temporarily and often withdraw them as the need arises. Sometimes, you may accidentally withdraw money that exceeds the minimum balance requirement. When this happens, banks may not only charge you with a penalty fee but also deactivate your account for failing to keep the maintaining balance. For this reason, choose a bank that offers low maintaining balance, one that can keep your account even if you’re not a regular depositor. Banks may put a limit on the amount of money you can withdraw or the number of transactions you can do per day. A good bank allows you to do as many transactions in your account without charging you with incurring fees, whether it’s for withdrawing and depositing money or transferring money between checking and savings accounts. While almost all banks now offer robust online banking services, nothing beats a bank that is close to your location and where you can do an over-the-counter transaction at a moment’s notice. If you’re usually busy at work during weekdays, it’s only logical to choose a bank with branches that are open on weekends. For instance, a popular commercial bank has a branch in every SM mall in the country and all these branches are ready to accommodate its clients 7 days a week. Since you won’t always be available to physically go to the bank to deposit or withdraw cash, priority should be given to seamless online/mobile banking. Transfer money to any account online without going to the physical branch for authorization. Deposit, withdraw or track money in your account through the bank website or smartphone app. Enroll autopay for bills payment. Secure an appointment in advance to avoid long queues upon arriving at the branch. Receive email or SMS alerts every time you withdraw from an ATM or make an online transaction. Other nice online banking features to consider include automated savings plans, budgeting tools, and stringent security measures to protect your account. A deposit insurance guarantees that you get back your insured deposits in case the bank fails and closes down. In the Philippines, all deposit accounts are insured with the Philippine Deposit Insurance Corporation for up to Php 500,000 per depositor per bank. To ensure that you’re depositing your money in a trustworthy bank, check if it’s a member of the Philippine Deposit Insurance Corporation (PDIC). Since the insured deposits are only limited to Php 500,000 per bank, it’s only practical to only keep money that doesn’t exceed that amount in a single bank. If you have extra cash, open another account in a separate bank and keep it there. If you want to spare yourself from the trouble, ensure that you can confidently keep more than the minimum insured deposit in a bank. Factors that you need to keep your eyes on are the bank’s track record, total assets, and the level of security provided in the branch you regularly transact with. Interest is what the bank pays you for trusting them to keep your money. It should be the least of your priority if you’re planning to only save a few thousand in your savings account. A competitive interest rate, or one that can keep up with the inflation, will only be of value to you if you have millions in cash deposits. If this is the case, look for a bank that offers all the features already mentioned plus a high-interest savings account. Otherwise, you can earn relatively more money by investing your savings in UITF or mutual funds. Banks with multiple customer service channels speaks volumes about their commitment to please their clients. If you want your issues to get resolved as soon as possible, choose a bank that lets you talk to an agent within minutes and whose customer service department can be easily accessed via phone, email, or social media channels like Facebook, Twitter, Instagram, Viber, just to name a few. To find out the best bank in the Philippines for savings, we had to zero in on three of the most important criteria: bank fees, interest rate, and customer service. We also considered the stability of the bank and its overall performance over the years. Based on these factors, our choices dwindled down to two–BDO and BPI. Related Article: Which is the better bank to open a savings account with: BPI or BDO? Both are two of the largest banks in the country as of 2018 with BDO’s total assets amounting to P2,665,307.23 and BPI’s at P1,649,267.36. Banks of this magnitude have a wide range of products and services as well as numerous awards under their belts. But none of these matters if they fail to serve individual clients well. As with any popular bank serving millions of customers, both may show occasional issues in efficiency. Long queues at their branches can look like a line to a blockbuster movie, especially during peak hours. Their customer hotlines, meanwhile, are plagued with inconsistency in terms of how they resolve customer complaints. Despite all the shared flaws, we still consider the Bank of the Philippine Islands (BPI) as the best bank to open a savings account. Founded in 1851 and known as the oldest bank in the country as well as Southeast Asia, BPI currently has over 800 branches and 3,000 ATMs and cash deposit machines nationwide. 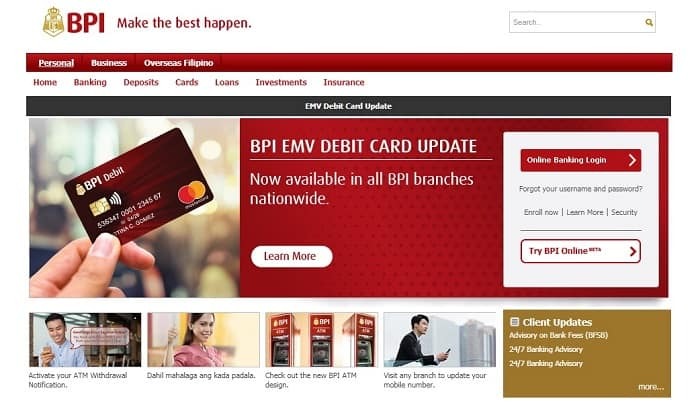 Although BPI has fewer branches than BDO, the former enables its clients to book an appointment online, enabling them to bypass the long queues at the physical branch. Even without using the convenience of online appointment, you can still visit the branch to deposit money, get your queue number, and comfortably sit in a chair while waiting for your turn. BDO, by contrast, provides neither queue numbers nor chairs. Transactions are also slower since BDO doesn’t have an automatic queuing system like BPI’s that would have enabled them to pull up the client’s account in advance. Fortunately, both banks now have cash deposit machines in every branch that allow you to conveniently deposit money without lining up to talk to a teller. For anyone planning to open a savings account to regularly deposit money, both BDO and BPI are great choices by virtue of their cash deposit machines alone. Now let’s get down to the nitty-gritty: While BDO has more branches nationwide (with those located inside SM malls open even on weekends), its unreasonable fees are a major turn-off. There is a processing fee for literally every transaction you make with BDO. Transferring from a foreign bank? You’ll get charged at least $10 regardless of the amount you transfer. Withdrawing money over the counter? Expect a withdrawal fee. Receiving money from other banks? Of course, there’s a fee. But here comes the worst part: BDO seems to treat its branches separately so when you deposit or withdraw money in a branch other than the branch where you opened your account (i.e., account holding branch), you’ll be slapped with fees for the said transaction. BPI, on the other hand, is significantly less greedy. For instance, you can withdraw money over the counter at other branches without getting slapped with a fee. Interbranch deposits are likewise free of charge. They also have a Transfer to Anyone feature if you want to securely transfer money online to unenrolled BPI accounts. In terms of interest rates, BDO offers as much as 1.25% for its Optimum Savings Account holders. The highest that BPI can offer is only 0.75% for those with an Advanced Savings Account. However, as mentioned in the previous section, interest rates aren’t the best way to gauge the performance of a savings bank. If anything, even the highest interest rate can only give you coffee money every year unless you have millions in cash to put in the bank. When you’re keeping millions in your savings account, it’s only appropriate to expect higher returns. Fortunately, there are banks that offer high-earning savings accounts specifically for people like you. 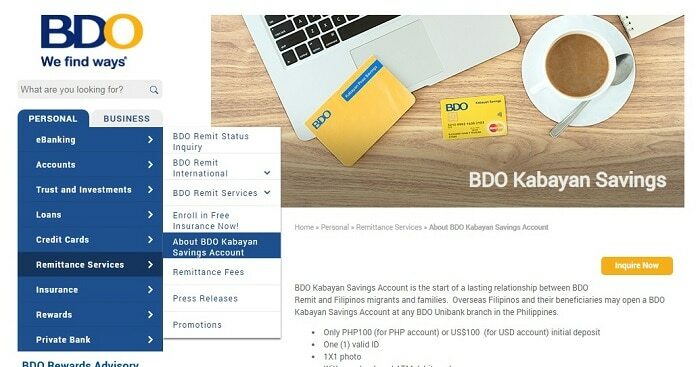 As of this writing, BDO offers as much as 1.25% annual interest rate for their Optimum Savings account holders. This is subject to changes though so I recommend calling your preferred BDO branch for the latest interest rate. The drawback is you need more money to open and maintain an Optimum Savings account than a regular one. For Personal accounts, Php 30,000 is the minimum initial deposit and also the minimum balance to earn interest. Business accounts, meanwhile, require Php 50,000. Security Bank has a better offer: eSecure Savings (eSS) with an initial deposit/maintaining balance of only Php 500 and up to 1.20% interest rate if you manage to save at least 5 million pesos in your account. Available to Security Bank’s Peso Casa clients, the eSecure online savings account requires a minimum balance of Php 5,000 to earn interest. You can open up to 10 accounts and manage them anywhere through Security Bank Online. Another high-yield savings account you may consider is also Security Bank’s very own Build Up Savings Account. This is ideal for those who want to grow their money faster but don’t want to be locked-in. It requires Php 5,000 initial deposit and maintaining balance. Regular account holders with a minimum balance of Php 10,000 can enjoy 0.50% interest while premium account holders with a minimum balance of Php 50,000 can earn 1% interest every year. Checks are more convenient and safer to carry than cash. To issue checks when making payments, you first need to open a checking or current account. When choosing the best bank in the Philippines for checking account, look for a low initial deposit and maintaining balance. Since checking accounts aren’t suited for saving money, interest rates are irrelevant. More importantly, choose a bank that doesn’t require you to have pre-existing savings account with them before allowing you to have a checking account. For this reason, both BDO and BPI fail to make the cut since both big banks can’t provide you with a checking account unless you’ve maintained a savings account with them for at least 6 months. Security Bank’s All-Access Checking Account sounds like a great idea at first (free life insurance, Php 5,000 initial deposit, and a savings and checking accounts in one). However, its all-in-one-package may scare clients who only prefer a checking account. And that brings us to Philippine National Bank’s wide range of checking accounts. Leading the pack is the Budget Checking Account, a non-interest earning account with a minimum initial deposit and maintaining balance of only Php 500. You can have 3 negotiations per month for free and then Php 20 per transaction thereafter. PNB’s Regular Checking Account, on the other hand, requires Php 10,000 as initial deposit and maintaining balance. You can monitor your checking account via online banking and make interbranch/interoffice transactions free of charge except in select provincial branches. Most people shy away from rural banks due to issues of stability. The fear is not unfounded as BSP is becoming more aggressive in closing down low-performing rural banks in the country. Therefore, should you decide to deal with a rural bank, choose one with proven longevity and sustainable assets. With these criteria in mind, we’ve chosen One Network Bank (ONB) as the best rural bank in the Philippines. Acquired by no less than Banco De Oro in 2014, ONB is now the largest rural bank in the country with its fleet of over 120 branches and more than 220 ATMs, most of which are in Mindanao. It also has branches in Makati City and a few around the NCR. 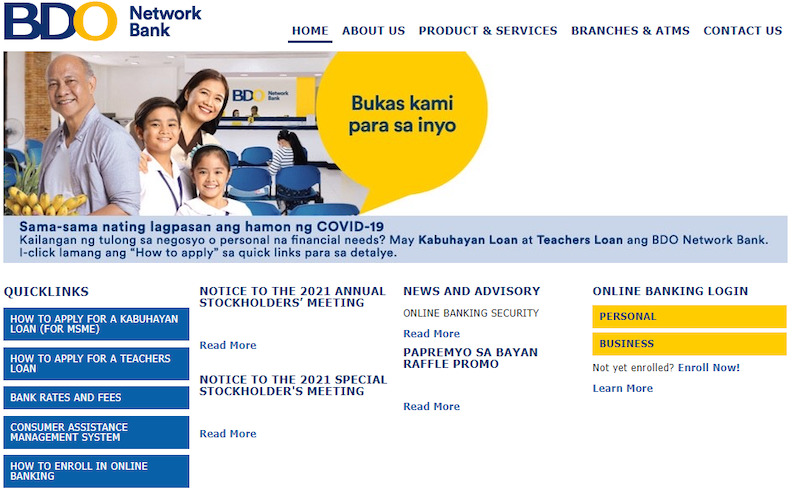 Since it’s the rural bank subsidiary of BDO, you can also tap the latter’s large ATM network to withdraw or deposit money anywhere in the Philippines. ONB offers both savings and checking accounts, the first rural bank to do so. With only Php 500, you can already open a Peso Savings account with a competitive 0.30% interest rate. Kids and teenagers are also encouraged to save money and develop their personal finance IQ early through the Young Pera Savers. Staying true to its roots as a rural bank, ONB also offers salary and business loans for professionals and micro-entrepreneurs who together contribute to the economic growth in the countryside. A time deposit is an ideal investment for the risk-averse. It earns higher interest than a regular savings account but requires a specified time of maturity. Depending on your goal, the maturity period can last from 1 week to 7 years. While your money is locked in, you can receive interest payments in your preferred frequency–annually, semi-annually, quarterly, or monthly. It only makes sense to choose a bank that offers the highest interest rate for time deposit accounts. But the interest rate isn’t the only parameter you need to look into. An ideal time deposit account also gives you the flexibility to pre-terminate your account once an immediate need arises. Among the time deposit accounts we’ve reviewed, Security Bank’s Peso Time Deposit stood out. From a user experience standpoint, it’s website excels in providing everything one needs to make an informed decision. 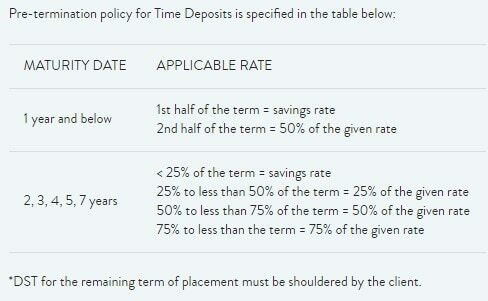 Not only does it provide comprehensive information, but it also features a unique time deposit calculator to give you an idea of how much you can earn from a time deposit. Security Bank also has the highest interest rates for time deposit accounts in the industry. For a minimum investment of Php 100,000 in a 2-year tenure, you can earn Php 3,560 at an interest rate of 2.225%. Of course, you’ll get paid bigger the longer you keep the money in your account, the maximum time being 7 years. 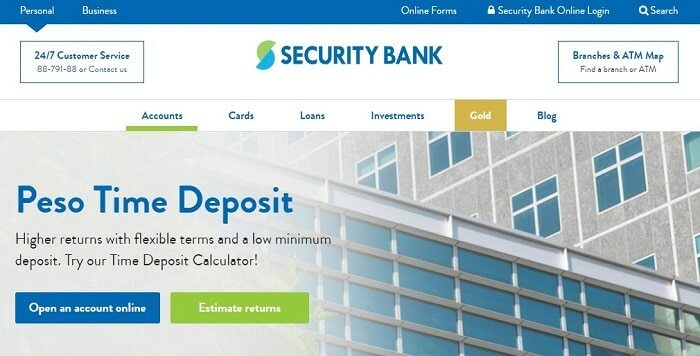 Aside from Philippine pesos, Security Bank also offers time deposit accounts for US dollars and Chinese yuan with minimum placements of USD 1,000 and CNY 5,000, respectively. PayPal is an online payment system that allows you to receive and transfer money electronically. It’s good for paying bills or goods online but if you want to encash your PayPal funds, you need to link it to a local bank. In my experience as a freelancer, the two best banks that work for PayPal are Security Bank and Unionbank. As much as I’d love to use Security Bank because of its zero annual and withdrawal fees, the Php 5,000 minimum deposit defeats the purpose of using it for PayPal withdrawals. If my intention is to save money, I’d rather open a regular savings account. Unionbank EON, by contrast, doesn’t require an initial deposit and maintaining balance. Fund transfer takes 5-7 business days according to Unionbank’s information page but I usually get my money in a shorter time frame. My only complaint in several years of using Unionbank EON is their customer service. The EON hotline doesn’t respond at all so I have to connect with the main Unionbank hotline every time I encounter some issues. Other than that, Unionbank EON is good for PayPal if you don’t mind paying small fees for the transactions. Whether you’re living in the Philippines permanently or for an extended period of time, you need to have a bank to handle your financial transactions. Expats usually choose banks that trade internationally–either national banks like Bank of the Philippine Islands or international institutions like Citibank and Bank of America. To choose the best bank in the Philippines for expats, we focused on the following parameters: ease of application, online banking, and fees (most importantly ATM fees). Foreigners with either immigrant or non-immigrant visas and who have been in the country for over 59 days are required to present an ACR I-Card. You can secure this document from either the main or field offices of the Bureau of Immigration throughout the country. Other requirements include your foreign passport and proof of address like utility bills. Some banks may let you open an account even without the ACR provided that you talk with the bank manager directly. Other institutions are more strict and don’t let expats open an account without proof of their permanent residency status. 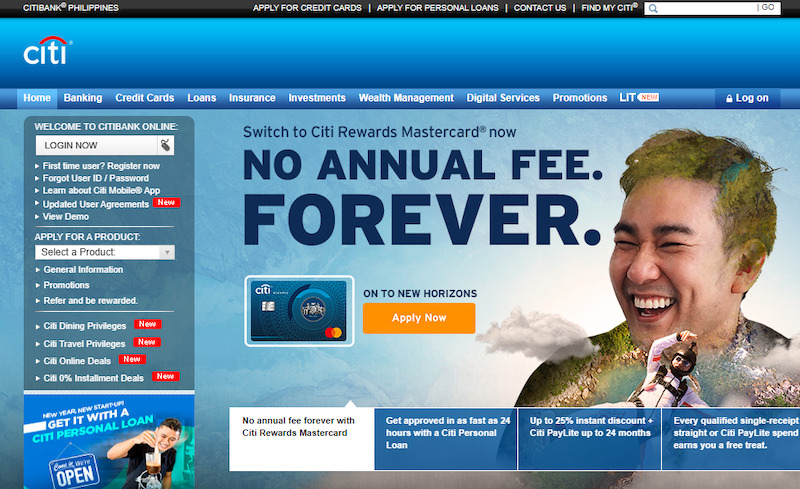 Among all the banks we’ve reviewed, we consider Citibank as the best bank for expats. Applying for an account is seamless and so are its online banking services. The latter is crucial especially because Philippine banks are notorious for providing slow over-the-counter services. On top of all these, Citibank offers free withdrawals from any ATM in the Philippines and over 20,000+ ATMs around the world. Without Citibank, withdrawing money from other ATMs here in the Philippines can be really expensive. In addition to the fees charged by your foreign bank, the Philippine bank also takes at least Php 200 for each transaction, not to mention you can only withdraw Php 10-15,000 at a time. If you have multiple Citibank accounts in different countries, you can also transfer money from one account to another with no transaction fees. Whatever bank you choose, ensure that you read the terms and conditions as if you’re reviewing a job contract. Citibank, for instance, charges a monthly fee of Php 500 if your balance falls below Php 500,000. As an OFW, it has always been your goal to secure your family’s future and have a financial cushion in case your life in the foreign land goes awry. An ideal bank for OFWs, therefore, is one that doesn’t just offer a means to save money but also life insurance tied with it. With these in mind, we’ve eliminated Metrobank’s OFW savings account because although it requires zero initial deposit, it doesn’t come with life insurance and a large bank network. After careful deliberation, we can now give the crown to BDO as the best bank in the Philippines for OFWs. Through the BDO Kabayan Savings, you can now open an account at any BDO branch with only Php 100 (Peso account) or $100 (Dollar account) as initial deposit. As long as you remit at least once every year, you can keep your account even with zero maintaining balance. Most importantly, opening a Kabayan savings account qualifies you to get a free life and accident insurance. It also builds your credit history with BDO, making it easier for you to apply for loans in the future. 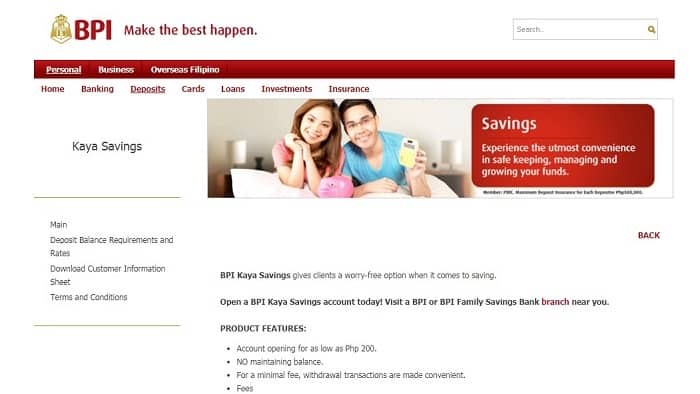 The runner-up is BPI’s similar product called Pamana Savings Account. Like BDO’s Kabayan, Pamana also offers free life insurance but a relatively higher initial deposit requirement. Related Article: I’m an OFW and currently based abroad. Can I have someone in the Philippines open a BPI account for me? Mounting school expenses should never be an excuse not to save money. When choosing the best bank in the Philippines for students, we only focused on two things: low initial deposit and the bank’s accessibility. Both BDO and BPI have the largest network of banks and ATMs in the country. Most of these are located within a short distance from schools to make it easier for students to make transactions. But between the two major banks, only BPI offers student-friendly savings accounts. With an initial deposit of only Php 200 and no maintaining balance, the BPI Kaya Savings eliminates virtually all excuses that would have prevented even broke students from saving up. Unlike BDO that has been notorious for “finding ways” to charge its clients, BPI only charges Php 5 for ATM withdrawal and Php 100 for over-the-counter withdrawal. Kaya Savings Account holders also get to enjoy a 0.250% annual interest rate for a minimum balance of Php 1,000. Hello. I have just moved to Manila from Brisbane. 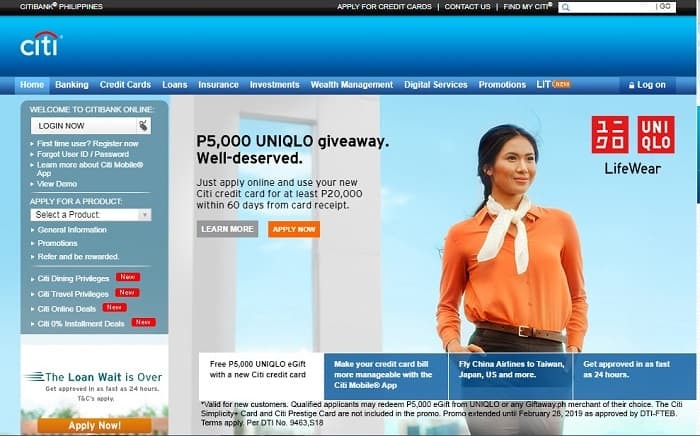 It seems many banks including BDO in Philippines are horrible in their online offering. Do people here not even have a basic expectation to apply online and everyone goes to the branch? It’s like 1990s here. Welcome any recommendation for a young(ish) professional who wants a modern local account. Citi is nice but don’t like their fees etc. Prefer a local account as I’ll be here for a few years. Thanks! Philippine National Bank requires that you have an existing savings account for about 6 months before you can open a checking account.